How To Customize WordPress Login Footer Without Any Plugin? Whenever you open the login page of your WordPress website, you see the default structure of the page. If you have a membership website or similar to that, you can change it by adding something extra below the login form. As you know, you can change the WordPress login URL, you can totally remove password lost link etc. In this tutorial, you will learn the best way to customize WordPress login footer. I am going to show you a procedure to add a text or a link so that people can go back to a custom page of your website. Use The functions.php File of Your WordPress Theme. There are many files included in the WordPress theme from which, the functions.php file handles all the functions of the theme. You can use it to customize your login page. Whether it’s about hiding the password link or banning people to change the password from the login area. 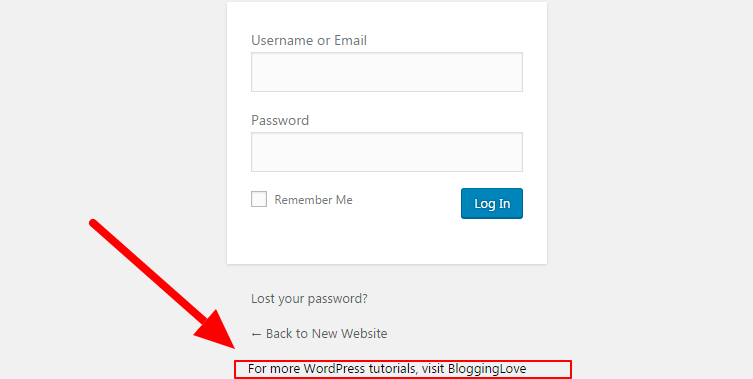 You will see a hyperlink below all the text of the default WordPress login page. Here, I have used the text “For more WordPress tutorials, visit BloggingLove”. You can edit it according to your requirements. There are many websites which are using this feature to improve the user experience. The default link would be to the homepage of your website. But if you want to add the link to any custom page then you can do that like this. Many websites use a different folder for their blog page. Suppose your website is located at “http://www.yoursite.com/blog“. Well, add this link to the text you want. I have added the inline-CSS to place the text just below the login form and other links. You can adjust its position according to you. If you’re a techie person and knows about WordPress codes then it won’t be a problem for you. What Would You Like To Add In The Footer Area of The Login Page? We all have something different to provide. What do you have to show? As I have mentioned above, most of the membership websites, community websites are using the customized footer area. It’s the matter of choice. What’s your choice? How would you like to customize WordPress login footer area? If you face any problem, feel free to contact. Can’t Install Plugins? Do You Know What Are The Reasons? It really sounds effective tutorial with images. Even after working with WordPress for a long while, many people are still surprised to learn that the Wp login footer can be customize without any plugin to their website and this will definitely beneficial for them to observe whole mechanism. Customization is not only about design but can also include functionality changes such as automatic redirection after login. This results in better user guidance and helps move visitors along to landing pages, the home page, forums, or wherever we would rather have them. Eventually, thanks for sharing your worthy thought with us. WordPress has many new things to do. You can design the whole login page. I have just mentioned the footer here. But if you want to change the background-color, background-image, everything can be changed without any plugin. I am glad that you understand the concept of customization. Nice tip and very easy to do indeed. Earlier I was so afraid of doing any kind of smaller customization on my blog. But staying in touch with techie bloggers like you I have overcome my reluctance and can do little things now myself easily. Many thanks for sharing this very valuable tip. I am glad that now you have broadened your skills. There is nothing to be afraid of. There is only one safety precaution, before you edit the code, always do the backup of your whole website and the database. It’s a helpful way to guide your unknown readers who don’t know the way to your website’s special pages. You can add any custom template page. You covered so many useful WordPress tutorials here, and this one is an exceptional one. 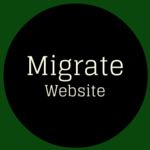 I see it very useful for those running multi-authors blog or membership sites where user had to go through the WordPress logging page. I never thought of this before, never. There is so much to learn about WordPress. I am just trying to teach the people who really want to know about it. For multi-author websites, you can really use this customization feature. It would be great to directly point the authors to any page which handles all the hangout. After reading this tips I have changed a website functions.php file. Now, It’s showing “500 Internal Server Error”. How can i solve it? Did you edit the right functions.php file? 500 error occurs due to many other reasons. You can’t have just because of any code. You can find the solution here only. Just search “500” and you will get the reasons and the solutions. Brilliant. I appreciate your knowledge, Mr. Ravi. I am always curious to experiment new things in WordPress. Definitely I will try this tutorial too. WordPress has a wide-spread area of experiments. You can do anything you want. With the use of the above-shown code, you can add any extra link in the login page.